The China-built Bubble minicar, which looks similar to the Smart ForTwo, will debut at the Bologna auto show. It has four seats and sells for $15,000 in Italy. TURIN – The 2010 Bologna motor show will host world debuts of new models from Ferrari, Opel/Vauxhall as well as Chinese automakers Chery Automobile and Great Wall Motor. Ferrari will unveil the 458 Challenge, the track-only version of its V-8 coupe, while Opel will debut the restylings of the Corsa subcompact hatchback and of the Antara medium SUV. Peugeot will show the EX-1 sports car concept. The 340-hp, four-wheel-drive electric roadster has broken six world records for electric vehicle acceleration. 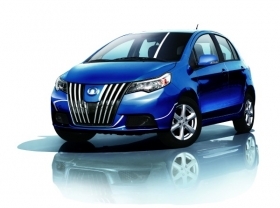 DR Automobili, an Italian company that rebadges versions of models built in China by Chery Automobile, will preview the D3 compact hatchback and an electric version of the DR1 minicar. DR sold 3,649 units in Italy from January to October, up 94 percent on the same period the year before, according to Italian Transport Ministry data. Great Wall will display the Voleex subcompact hatchback. Another Chinese carmaker, Great Wall, will give European debuts to the Voleex subcompact hatchback, the Steed 5 large pickup and the Kulla, a concept for a city car with extremely rounded surfaces. Land Rover will use Bologna for the European debut to the Evoque five-door SUV. 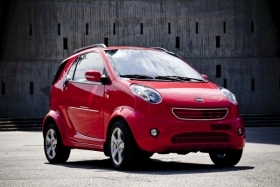 Italian auto retailer Martin Motors will display the China-built Bubble minicar that looks similar to the Smart ForTwo. At the 2007 Bologna show, Daimler AG, which owns Smart, took legal action to prevent Martin Motors from unveiling the Bubble minicar because of its similarity to the ForTwo. After a legal battle, Martin Motors said it is now allowed to sell a slightly tweaked Bubble in Europe. The 3300mm-long, four-seat Bubble, built by Chinese carmaker Shuanghuan, sells for 11,400 euros ($15,000) in Italy, a price that includes air conditioning, power windows and alloy wheels. Visitors to the show, which runs from Dec. 4-12, will be able to road test electric cars from automakers such as Citroen, Mitsubishi, Nissan, Peugeot, Renault and Smart on an indoor urban circuit, which is as big as a soccer field. 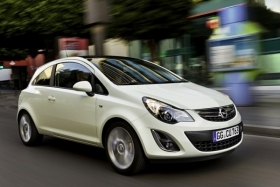 The Opel Corsa gets new front styling as part of a face-lift. The Bologna show is bouncing back from a crisis last year when major automakers, including Fiat, pulled out due to the recession. The 2009 show was curtailed by four days and featured only car and motorcycle races and attracted 460,000 visitors, half as many as in the previous year. “This year's show returns to its traditional nine-day calendar and goes on despite the economy not being completely out from the crisis yet. We hope attendance is close to the level seen in 2008,” said Giada Michetti, managing director of the show organizer GL Events Italia. In 2008, the show attracted about 970,000 visitors. Ferrari will show in Bologna the 458 Challenge, a track-only version of its V-8 coupe. Missing from this year's show are Asian brands Honda, Lexus, Mazda, Subaru, Suzuki and Daihatsu, as well as General Motors Co.'s Chevrolet. From Europe, Lamborghini, Jaguar and Saab are skipping the event. BMW and Mini withdrew from the show in 2008.